Okay, so I may be on the last minute with the rest of my Christmas Gift Guides... however I've declared this week 'Guide Guide Week' on Makeup Savvy! So you can expect two more gift guides this week - Under £20 and quite a large 'For Him' gift guide that I surprisingly enjoy putting together! 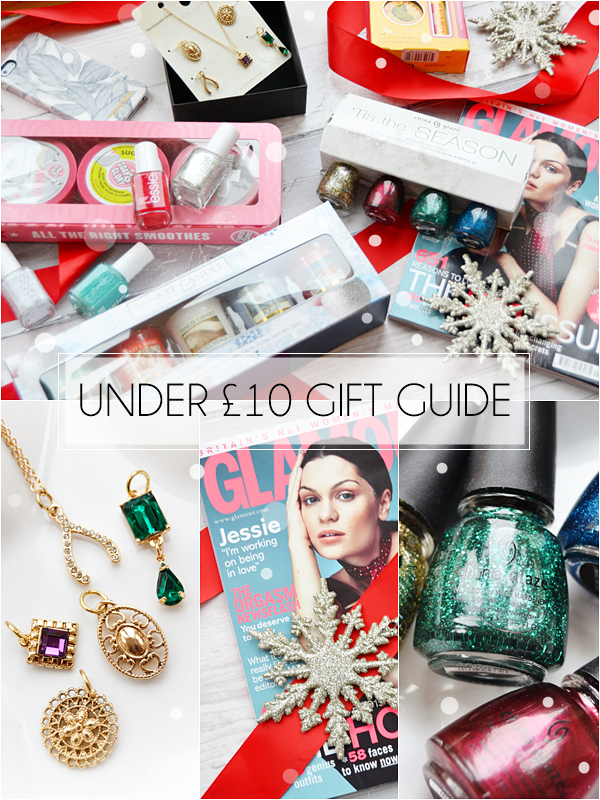 Hope you enjoy this Under £10 gift guide and it gives you a few gift ideas or last minute presents to ask for! So S&G are pretty good for gift sets at Christmas! Their packaging is on point, as is their pricing and they fail to seem genetic unlike a lot of gift sets around the £10 mark. One of my favourite sets has to be the above trio as I love all Soap & Glory Body Butters. The trio includes The Righteous Butter, Butter Yourself and Sugar Crush all in a 50ml size making them perfect to try out. My absolute favourite scent from S&G has to be Sugar Crush (it smells of lime,almond and coconuts) so I'm very pleased to see this included in the set. A great quality gift set for all ages! Now this may seem like a small gift but it includes two of my favourite products from Burt's Bees so I had to include it. The set includes a full size Burt's Bees Pomegranate Lip Balm that offers a nice red/pink tint and a sample size Lemon Cuticle Butter (trust me this product lasts forever) which smells oh so amazing... think lemon bon-bons and keeps cuticles in perfect condition especially in Winter. 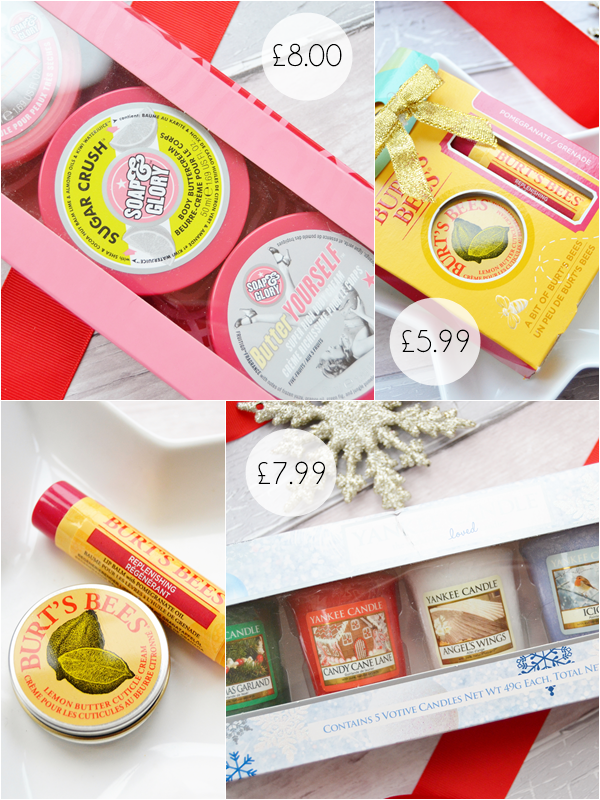 Burt's Bees also have quite a few nice gift sets under £10 which can be found in the link above, though it's worth looking on Amazon as you can often find a bargain. A sneaky possible gift for yourself here or of course to give to a candle lover. This lovely set is pretty much sold out everywhere except on eBay where you can still find it for £7.99 with free delivery, which is a very good price I think. Included is 5 festive votive candles - Christmas Garland, Candy Cane Lane, Angel Wings, Icicles and Christmas Eve. This set really does smell incredible and includes a few new Christmas 2014 scents so it's even worth giving to someone that is Yankee Candle obsessed! As soon as I spotted this necklace on the ASOS website I knew I had to get it. This is such a clever idea as it's essentially five necklaces in one... in fact you could wear the necklace with a few charms on it. I actually love all the different charms but especially love the little wish bone as it can be worn either showing the little diamantes or turned over to show the plain gold finish. Also comes in 3 other styles! I personally think magazine subscriptions make an amazing gift! I've both given and received many in the past few years and feel it's really a gift that keeps on giving as the recipient is receiving their magazine each month. Magazine subscriptions generally cost £15-30 however looking at 6-month options does make the gift much cheaper! Here I've gone for a 6 month Glamour subscription which is only £8. What I like about Glamour subsciptions is that recipient doesn't miss out on the free gifts unlike a lot of other magazines. Now the above case is over £10... it's £12.50 in fact (because it's for the iPhone 5). But Iconmesis currently have a huge 40% off at the moment making all their iPhone 4/4s only £6 here. This is pretty damn amazing as the quality of these phone cases are the best I've come across and with the loveliest designs. My favourite one has to be the Coffee Collection case here. If you know someone with an iPhone then one of these phone cases could make a great gift - trust me, they will be impressed! Ahhh, how I love China Glaze Holiday gift sets! Perfectly glittery and with festive names this set couldn't be more suited to Christmas. Shades include Define Good, De-light, Pine-ing for Glitter and Feeling Twinkly and though mini sized they're actually near to the full size polishes. What I also love about CG holiday sets is they are limited edition making them that bit more special. If you know a nail polish lover then this is certainly a gift worth buying them. 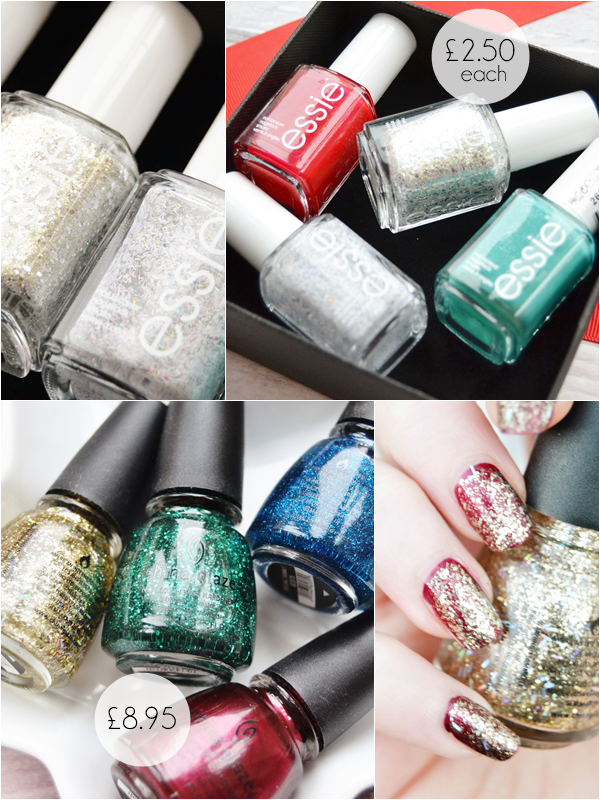 Another idea is to make your own nail polish gift set with discounted Essie nail polishes. Essie polishes are amongst some of my favourites and priced at only £2.50 from £8.00 they're a total bargain on Fragrance Direct. As above you could buy 4 Essie polishes for £10.00 and place them in a nice gift box. Unlike a gift set this means you can pick the exact shades you think the recipient would like the most. I'd love to receive something like this! 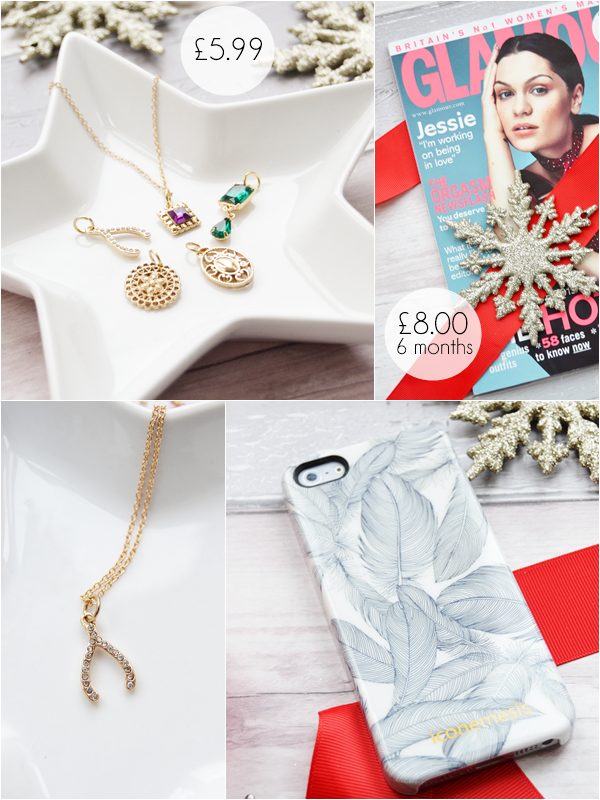 Hope you've enjoyed this gift guide, you can find my Under £5 Gift Guide here and my Never Ending Gift Guide here.